Access 97, 2003 and 2007 has support for standard class modules lets you greatly extend the functionality of standard controls. In this article, Jim shows you how to make Access unbound list and combo boxes behave more like those in Visual Basic by adding a few new methods and properties via a standard class module. VISUAL Basic 4.0 added a new module type known as a class module. Class modules are distinct from standard modules in that they can be used as templates to create, or instantiate, objects. These objects can have their own data, and have their own functions, or methods. They allow for a style of programming known as Object-Oriented Programming, or OOP.Access 95 added limited support for class modules. The module code associated with each form or report is a class module. Using these class modules you could create public properties and methods for your forms. This allowed you to create multi-instance forms and reports for the first time. But you couldn’t create standalone classes that weren’t associated with a form or a report, as you could with VB 4.0. Access 97 and upwards removes this limitation on class modules. You can now create classes which you can use in your application to create a variety of useful structures. You can create non-visual objects such as linked lists, or model real-world objects in your code. You can also use class modules to hide complex procedures by creating an object “wrapper”that exposes a simplified interface to an object. This article discusses a way to use Access 97 classes to provide new functionality to Access’ standard list box and combo box controls, while simultaneously making your code easier to read and maintain. 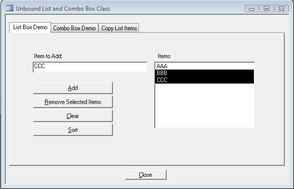 Access’ bound combo and list boxes are both flexible and easy to use. Simply assign a query or table as the RowSource of the list box, and Access automatically fills the list based on the contents of the query. In Access you have two choices when working with unbound list boxes. The most flexible method is to create a complex list filling callback function, which Access itself calls to populate the list. This function must conform to a rigid format of argument types, and must support several specific actions, such as providing the number or rows and columns, initialization and termination, and so forth. For information on using list filling callback functions see the Access 97 help topic titled RowSourceType Property (User-Defined Function) or Ken Getz’s article in the October 1993 issue of Smart Access. This example takes the current value of the RowSource property of the list box, appends a semicolon (;) character, and then appends the new value, which in this case is contained in a text box called txtURLs. This is easier, but still limited. There’s no simple way to remove an item from the list, or to sort it. In order to modify the list you must completely replace it, being sure to keep all your semicolons in the right place. My first goal in creating the list box class module is to add new functionality to the standard Access list box. Modeling the interface after that of VB, which many Access programmers may be familiar with, I want to create the following methods: AddItem, RemoveItem, and Clear. These will be the supported “methods” of the class. Because of the drawbacks of storing the list information in the RowSource property of the list box itself, the class should maintain its own list of values. In my example I use the Access collection object to store the values. This is the class’ instance data. Finally, I want to create a wrapper around a standard list box, keeping all of its native functionality while adding new capabilities. I create a pointer to an actual list box on a form, and perform all work through that pointer. The class thus encapsulates a standard list box. To create an Access 97 class module you can’t simply press the New button on the Modules tab of the database container. This creates a standard module. To create a class module you must explicitly use the menu option Insert, Class Module. 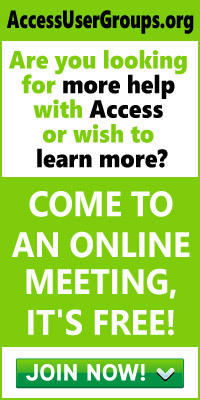 By default, Access gives it the name Class1. As with other Access objects, it’s important to think carefully about the name of your class module. Unlike standard modules, where the name of the module itself is relatively unimportant, you actually refer to the name of the class module when you create instances of objects based on that module. I’ll call the class “clsUnboundList” because its function is to provide a wrapper around unbound list and combo boxes. The variable is declared Private, because I want users to modify the data in the collection only by means of the Additem, RemoveItem, and Clear methods, or by internal helper functions within the class itself, which I’ll discuss later. Notice the difference between module-level variables declared in a standard module vs. those in a class module. The variables in a standard module occur only once in the entire application. Module-level variables in a class module, on the other hand, are maintained separately for each instance of the class that is created in code. This allows each instance of the clsUnboundList class to maintain a separate list of data for its list box or combo box. The module-level variable named moURLs will remain valid until the form closes. When the form closes the variable goes out of scope, and the objects created from the variable are automatically destroyed. When you use this method, you don’t need to use an explicit Set statement to create a new instance. Any reference to the class’ methods or properties automatically instantiates the variable. The drawback to this method is that Access must include additional overhead checking throughout your code to determine whether or not the variable has already been instantiated whenever you refer to the variable. [Plus, it makes it more difficult later during the debugging cycle to determine when the object was instantiated.—Ed.] Using the first method makes your intentions clear, and is Microsoft’s recommended style. The second Set statement shown in the form’s OnOpen event passes a pointer to an actual list box on the form, called lisURLs, into the class. It does this by setting the Control property of the class to the list box. Access classes include three kinds of specialized procedures known as property procedures. In addition to standard Function and Sub-type procedures, your classes can include Property Set, Get, and Let procedures. These procedures are used to assign or retrieve values to the properties of the class. Property Get procedures are used to retrieve values from a class. Property Let procedures are used to set the value of a class’ property. You can use the Get and Let procedures to validate input, or to provide additional processing as a result of setting or retrieving a value. The clsUnboundList example doesn’t require any Property Let or Get procedures, but these are important and useful constructs that you should be familiar with. MsgBox "Please assign only list boxes or " & _ "combo boxes to this property"
Because I want the user to be able to use either a list box or a combo box with the clsUnboundList class, I declare the parameter to the Property Set Control procedure “As Control” rather than “As Listbox” or “As ComboBox”. This makes the property procedure more flexible, but I must then use some additional error trapping to be sure that the user doesn’t supply the wrong type of control, such as a text box or a command button, to the property. The Property Set procedure checks to ensure that the passed argument is a list box or combo box, and then assigns the passed argument to the class’ private module-level mControl variable. Users outside the class aren’t allowed to refer to the mControl object directly. They can use only the property procedures and other procedures that I provide through the class. Code within the class is able to refer to mControl directly, however, as in this example where the passed control’s RowSourceType is explicitly set to Value List. Because mControl just contains a pointer to an actual list box or combo box, changing the RowSourceType of the mControl variable automatically has the effect of changing the same property on the real list box or combo box. Most of the user interface to the clsUnboundList class isn’t provided through property procedures. Instead the class contains public procedures that can be accessed via an instance variable created from the class. This is how the AddItem, RemoveItem, and Clear methods of the class work. The sub is made public so that code outside of the class itself can call the procedure. The argument varItem is a variant so that the user can pass strings, or numbers, to the procedure without having to do an explicit type conversion. This syntax fulfills the goal I originally established of making the Access list box behave more like a VB unbound list box. You can repeatedly add items to the list box using this simple syntax instead of using a list filling callback function or maintaining your own value list. How do the items actually get added? The items are added to the list by the public class’ AddItem subroutine, which is shown in Listing 1. The AddItem method begins by checking its private mcolItems collection to see if the item is already in the collection. You can provide any behavior you want for your list box AddItem routine. This procedure simply ignores duplicate values, but you could generate an error, or even allow duplicates if you like. The Collection type isn’t new to Access 97. It first appeared in Access 95. I’m using a collection to store the class’ instance data, but this could have been done with an array or some other method. Adding the item to the collection is fine, but how does that get the updated list of items into the list box or combo box? The AddItem procedure, and several other methods of the clsUnboundList class, make use of a simple helper function called ConcatRowSourceStrings (see Listing 2). Once again, because the private mControl variable has been set to the value of a real combo or list box on the form, changing one of its properties actually changes the same property on the original control. So setting the RowSource property of the private mControl variable also changes the RowSource property of the original list box. Access automatically displays the updated list. The RemoveItem method works similarly to the AddItem method. The basic idea is to remove the item from the class’ private mColItems collection, and then re-create the RowSource string from the remaining values using the ConcatRowSourceStrings function. I perform a small amount of validation here to ensure that the index item that is passed is actually a valid item number. So far I’ve simply been taking functionality from VB and adding it to Access’ unbound list and combo boxes. What if you want to add completely new features? The beauty of using class modules to encapsulate standard Access objects is that you can add as much or as little new behavior as you like. You can customize the control to meet your particular needs. 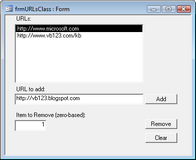 To get you started on customizing the clsUnboundList class I added two completely new methods, RemoveSelected and Sort. The code for the RemoveSelected method is shown in Listing 3. The RemoveFromCollection helper function is declared as a private procedure. Unlike the public methods of the clsUnboundList class, this procedure is only intended to be called from other procedures within the class itself. The code simply loops through the mcolItems collection and removes the value matching the varItem argument. I’ve already discussed the public RemoveItem method of the class, which takes a numeric zero-based index for a list box or combo box and removes the corresponding one-based item from the private mcolItems collection. Here the RemoveSelected method calls the RemoveItem method on itself (using the Me syntax familiar to Access Basic programmers when used in code behind forms.) The ListIndex property of a combo box refers to the item that is currently selected in the list (the one we want to remove). Because the ListIndex property is already zero-based, it fits in perfectly with the existing RemoveItem method. And because the method is available for others to use, we might as well use it ourselves! The Sort method (see Listing 4) makes use of a standard QuickSort function, QSArray (see Listing 5), which is designed to work on arrays rather than collections. The Sort method writes the values in the mColItems collection into a temporary array, sorts the array, and then writes the sorted values back into the collection. After sorting the collection, the RowSource of the control is re-created with the ConcatRowSourceStrings function. One thing to consider is which of these types of helper functions belong in the class itself, and which might be better off in a separate standalone module. The advantage of including the helper functions such as QSArray directly in the class is that this makes the class totally self-sufficient. You can copy the class into any Access database and use it without having to worry about any required functions that might be found in other modules. The disadvantage is that the code is essentially duplicated for each instance of the class. You’ve already seen simple examples of using AddItem, RemoveItem, Clear, and Sort in code. Except for the housekeeping business of declaring the instance variable and assigning a control to it in the form’s OnOpen event, using the class methods is quite transparent in your code. You can use the fairly complex additional behavior encapsulated in these simple-sounding methods to do a number of other interesting things. Although the clsUnboundList class works well for relatively small amounts of data, there are limitations in its current design. Because I use the control’s standard RowSource property, the number of items that can fit in a list is limited to about 2,000 bytes. I attempted to make a version of the clsUnboundList class that would provide its values using the Access list filling callback function method I discussed earlier, but Microsoft has confirmed that the RowSourceType property of a combo box or list box can’t refer to a property of a class. It must be a function in a standard module or in the code behind a form. Dim strValue As String strValue = Me!lisURLs.ItemData(0) moURLs.AddItem "new item"
Me!lisURLs refers to the actual list box, while moURLs is the object variable of the clsUnboundList type that has encapsulated that list box. One solution is to create shadow properties and methods in the class that correspond to the standard properties in the list box. For example, you could create a Visible, Left, or BackColor property for your class. Setting the property for the class object would simply pass the value on to the encapsulated control. Whether this is useful behavior for your class—or just overkill—is something only you can decide. There are other ways in which the clsUnboundList class can be enhanced. For example, you could add a method to retrieve values from a table or query, or to write the values out to a table. You could allow for multi-column list boxes or provide a search function. I’ve barely touched on some of the new capabilities that Access’ new class modules provide. For instance, you can create class objects that contain collections of other objects. This lets you create essentially your own object hierarchy. I’ve been discussing the use of classes with unbound list and combo boxes, but there’s no reason you couldn’t encapsulate bound combo boxes, text boxes, or even forms and reports! You could add custom validation rules or specialized keystroke handling. Once you start seeing the possibilities of using classes in your application, everything seems like a candidate for the class treatment. ‘Listing 1. Create an AddItem method to mimic Visual Basic’s list box. MsgBox "Item may not contain " & "; characters"
‘Listing 2. Helper function to build RowSource string from items in the private collection. varResult = varResult & varItem & ";"
‘Listing 3. This procedure automatically removes all selected items from the list. ‘Listing 4. The Sort procedure sorts the items in the list using the popular quick sort algorithm. ‘can be hidden by encapsulating it within a class.